Document proofing is an important routine for writing and completing word document files. 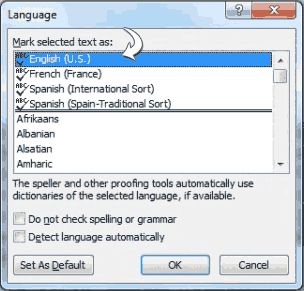 Microsoft Word program provide an easy option to select a different language for proofing documents. Using proofing language feature you can chose and use any specific language for documents being edited in Microsoft Word program. 1. Launch Microsoft Word 2010 program. Type document text or open any exisiting document file. 2. Select text in document using mouse or press Ctrl + A keys to select all text. 3. Then goto Review tab and click ‘Language’ option. 4. Click on ‘Set Proofing language’ option. In the pop-up window, select the proofing language type for your current word document.